Founded in 1899 by watchmaker Philip Laurence announced the release of its new, designed specifically for the beautiful half of the planet. 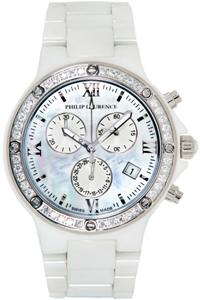 The model has a round body, which has adorned with Swarovski crystals bezel. Mother of pearl dial marked on Roman numerals, hour-markers, a small aperture date at “4:00”, three hands, and chronograph counters at the hour markers 2, 6 and 10. Hour and minute hands are covered with fluorescent material, which allows to determine the time, even in total darkness. Company logo adorns Philip Laurence dial set to “12:00”. Dial closes sapphire crystal. Complementing the new product from Philip Laurence ceramic bracelet black or white. Model Mark Philip Laurence appeared on the Russian market in 1997. This watch in a short time gained popularity among customers. For the last 14 years the name pleases the fans of this great range, which offers an affordable price. After all, the company designs its watches under the slogan – “affordable Swiss quality.” This proves once again that the brand Philip Laurence is doing everything to keep the price for consumers, without compromising the high quality of its timepieces.